Everyone knows that the market goes through a correction every once a while. The problem is not everyone knows when. Stocks slumped Tuesday 27th Feb on worries about economic growth at home and abroad especially China. The Dow dropped 416.02 points equivalent to 3.29%, its biggest one-day point loss in nearly 5 & 1/2 years. The S&P 500 tumbled about 3.5 % and the Nasdaq skidded 3.9 %. Chinese market dropped 9 % on concerns that the government was looking to crack down on market speculation that has driven chinese stocks to record highs. There are were also rumors that China is going to impose a high capital gain tax on stock investments. Other Asian markets slumped in tandem. European shares also tumbled. Former Federal Reserve Chairman Alan Greenspan said that U.S. economy might slip into a recession by the end of the year. Economic indicators showed the biggest monthly drop in new orders for nondefense durable goods, items meant to last 3 years or more. Reports indicated that the median price of an existing home fell 3.1 % in January from a year earlier, giving investors more reasons to worry about the housing slowdown hurting the economy. Increased violence in Iraq and Afghanistan also alarmed Wall Street. The Dow and S&P 500 have each risen 12 % in the past 6 months while the Nasdaq is up 17 %. Few of the big guns in the tech sector like Google (GOOG) lost 3.5 %, Yahoo (YHOO) lost 3.64 %, Microsoft (MSFT) lost 4.13 % and eBay (EBAY) lost 4.25 %. Chinese stocks got burned badly with CDC Corp (CHINA) losing 11.4 %, Telestone (TSTC) losing 13.97 % and Fuwei Films (FFHL) losing 11.53%. Those who shorted the Dow (DXD) and Nasdaq (QID) had a smile on their face. Both were up 4.21 % and 4.81 % respectively. 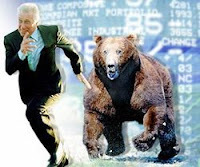 Conclusion: Analysts believe that nothing has changed fundamentally and investors do not need to worry about a bear market. Consumer spending has held up relatively well. The company profits/earnings has been positive. Analysts also believe that this sell-off could give the Feds a reason to lower interest rates which would evidently boost earnings. Recommendation: Commodities also took a hit and are now trading at a bargain. Alot of stocks are trading at a cheaper prices. For those investors that stayed away from the market, have a question in their mind for sure. Is this a good time to buy? Maybe, maybe not. The point is nobody knows. History shows that after a huge correction, the market trades lightly the next day indicating cautious investors. Any substancial upswing would not occur until day after tomorrow. Should We Trust These Analysts ? Analysts are typically employed by brokerage firms, investment advisors, or mutual funds. Analysts do the grunt work for brokers, preparing the research that brokers use. Analysts usually specialize in specific industries or sectors. I personally rely on analyst recommendations as one of the factors deciding buying or selling of stocks. Analysts are in a much better position to make a judgement about the stock than you and me. They go through alot of financial reports and indicators which passive investors dont even want to know. However one important question everyone should always always try to find out is Why ? Why are analysts giving buy or sell signals. Good analysts will always give you a satisfactory explanation and back their recommendation by giving you their sources. 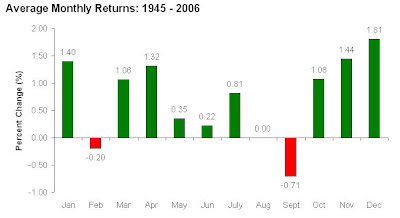 That said, what are analysts overall recommending in 2007 ? A research shows that the analysts are not too bullish in 2007. 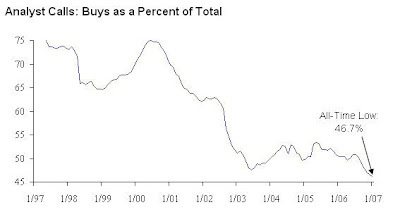 The overall buy recommendation as a percent of all recommendations is at its all time low over 10 years. This is scary isnt it ? Does that mean it is time to sell off ? Probably not. Infact as a rule of thumb, when the herd is in agreement on the market’s direction, the opposite usually occurs. Recommendations: Dont let some indicators scare you. Again the key is research. Try and understand why the analysts are bullish or bearish about the stock. If you find their reasoning satisfactory, only then bet accordingly.